Vintage Vibe. To capture the full experience and complexity of a vintage tape echo machine, every last tape system attribute was relentlessly studied and faithfully recreated. From the sought-after natural saturation and soft clipping of magnetic tape when driven hard, to hands-on real-time controls for tape age, tape crinkle, and mechanical wow and flutter, Magneto delivers a rich multi-head delay experience that adds life and vibe to your sound. Play It Like An Instrument. 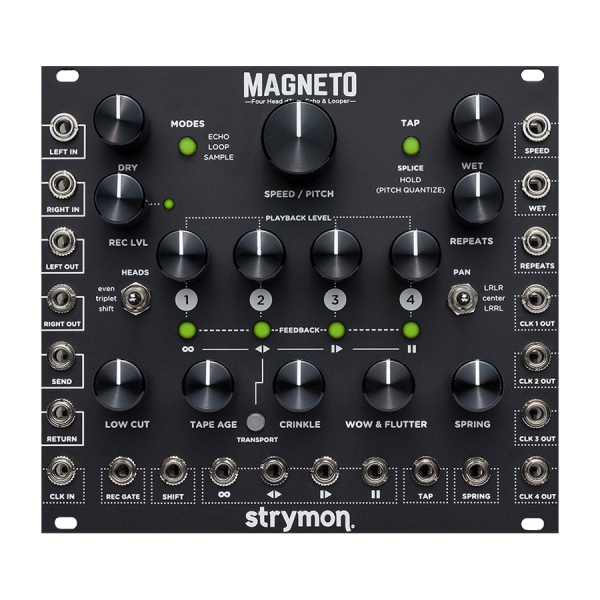 Every function, control, gain stage, and signal path component in Magneto works together to respond musically and smoothly, even during the wildest live modular improvisations. All this is combined with a luxurious spring reverb to take the sound of your modular setup to a new level, and your sonic explorations into far-out territories.